To setup a new SSL-Connection between a IBM HTTP Server (IHS) and your WebSphere Application Server (6.1) a (self-signed) CA SSL certificate has to be propageted to all involved servers. When setting up a IHS via the administrative console SSL between IHS and WebSphere AppServer should be enabled by default. This tags defines the location of the Key-Database for the secure connection between your IHS and your AppServer. On this page all necessary entries should be done automatically. 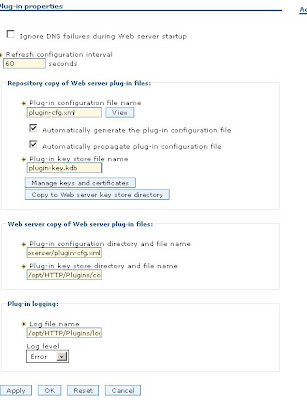 To re-copy the default plugin-in.key to your IHS press "Copy to Webserver key store directory". To manually setup SSL between IHS and WebSphere first locate the plugin-key.kdb on your AppServer. Than copy over the plugin-key.kdb to the IHS into the specified location (get location form picture above). Then edit the plugin-cfg.xml of the IHS (see tag from step 1). Then restart your IHS and your WebSphere instance.